Add an additional fee based on the shipping method chosen - for example, an additional handling fee or mandatory insurance for a particular shipping method. This allows you to charge more accurate shipping prices based on your actual shipping cost for each product. 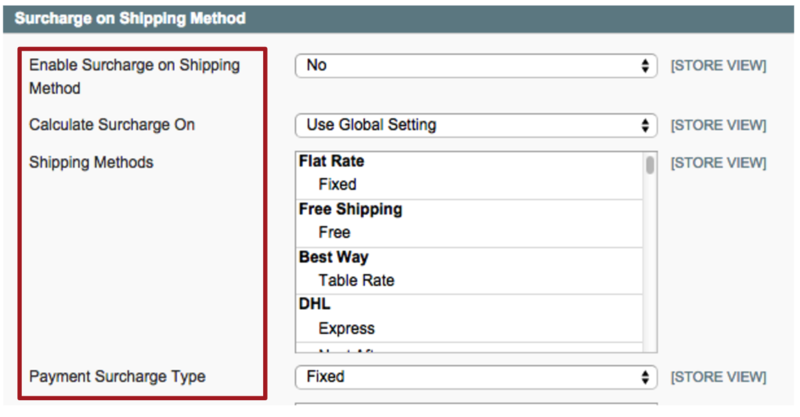 When set to Yes, a shipping method surcharge will be enabled. Choose to use the global Fooman Surcharge setting (the “Calculate surcharge on” setting in the All Surcharges Settings section), or to calculate the surcharge on the shipping cost only. Control-click to select as many shipping methods you wish to apply the surcharge to. Enter the fixed transaction cost you wish to charge - eg. 2 (remember not to add any currency symbols). Enter the surcharge description that will be visible to the customer – eg. “Express delivery premium”.